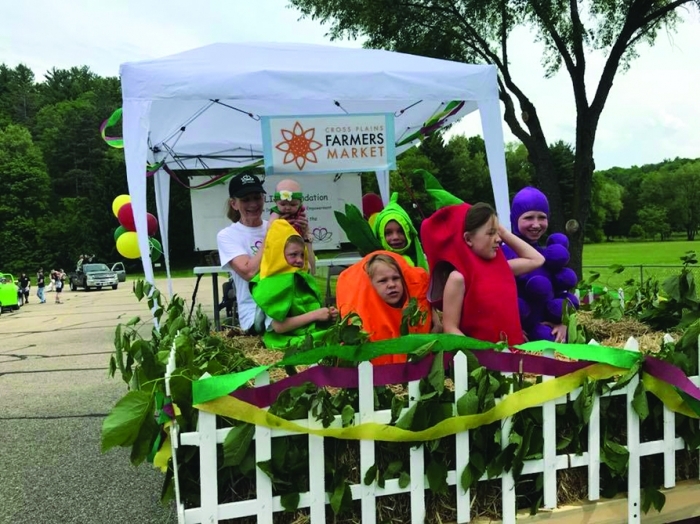 Area children ride in the Farmers Market’s float ; The LIFE Foundation founded the Cross Plains Community Garden located at Zander Park five years ago. “Lots of people were voicing that Cross Plains had limited programs for all ages, especially seniors. There were a lot of conversations about creating a community center,” said Swanson. “Jane got six people together and started the LIFE foundation. We first started out by attending the Health Wisconsin Leadership Institute (HWLI). HWLI is an organization created through a partnership between the University of Wisconsin School of Medicine and Public Health’s Wisconsin Partnership Program and the Medical College of Wisconsin’s Advancing a Healthier Wisconsin endowment. The HWLI provides systematic and accessible public and community health leadership training, education and technical assistance to support local agendas for community health improvement. For many communities, making headway on health issues requires a new way of working, which requires building skills in engaging with the community from the beginning, and looking at root causes. The LIFE Foundation was awarded a developmental grant from the HWLI to develop a strategic plan to impact our community’s health in a positive way by improving nutrition and increasing physical activity in a local, safe environment. “We were awarded a grant and made a strategic plan with five strategies,” Swanson said. “We were then awarded a second grant, an opportunity grant, in which focused on two main strategies: Empower Social Support and Gardens Grow. One of the first steps LIFE worked on was developing behavioral-change programs, campaigns, and policies to encourage healthy living and to build infrastructures conducive to healthy lifestyles. Creating a community center has been a long-term goal for LIFE, developing a community center for people of all ages to use for exercise and activities. “We have been wanting a community center in Cross Plains. There isn’t much space in the village, so activities are held at the American Legion hall or at schools, or the fire department. One of the reasons Jane Busch was being recognize is she was trying to get buy-in from all of the residents to get a community center together, and LIFE would be responsible for the management of the center,” Swanson stated. Jane Busch, founder of the LIFE Foundation, was recently awarded the Outstanding Community Citizen of the Year Award by the Cross Plains Area Chamber of Commerce in recognition of her work making a positive impact through her volunteer efforts and community service activities, working to improve nutrition, decrease obesity, and increase physical activity for members of the community. “It was good for the LIFE Foundation. I am glad to see they got some of the recognition they deserve, for all the things the people on the foundation have done,” Busch said. “People in our community are organizing to take action on priority issues for their community’s health. Jane was able to raise over $800,000 to purchase a vacant commercial building in Cross Plains, but despite her efforts, the deal fell through. We envision all ages being involved, little children, new moms, seniors…it would be a source to bring the community together. It’s one of the big emphases of who we are, in creating a community health program,” Swanson said. The LIFE Foundation works through five different strategies to improve health and nutrition. In order to promote healthy eating, the foundation coordinated the Cross Plains Farmers Market. “This is the fourth year of having the Farmers Market. It was first held at the parking lot along Mill Creek Pkwy., then in the parking lot by Piggly Wiggly, and last summer at the corner of Hwy.14 and P where it will be again this year. Over the years we have been trying to get new venders to sell their food, and typically we had dinner available there too. The farmers market is held on Wednesdays. Jane Busch helped recruit the vendors and make sure that the market runs efficiently, which requires countless hours. We had the Lion’s Clubs there providing brats, and previously we had mobile food carts, and Mike’s BBQ, which we are hoping is going to be back there this year. We had arts and crafts vendors one time, but now we’re going to have them once a month. With a Farmer’s Market we can have locally-sourced organic fruits and vegetables, and for a reasonable price,” Swanson said. 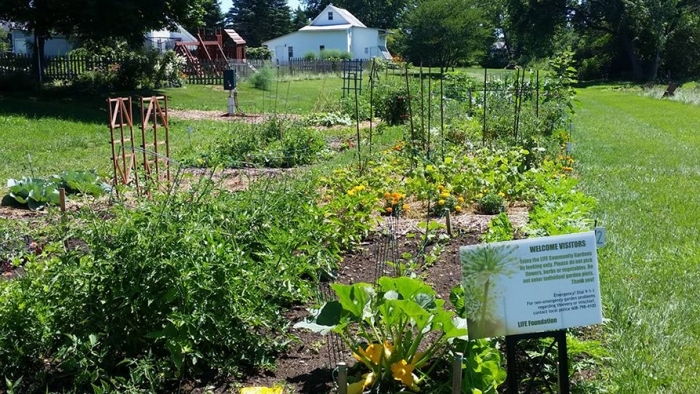 Another strategy is the Cross Plains community garden located at Zander Park along the banks of the Black Earth Creek. “This is the fifth year we’ve had the community garden. We also do a senior garden at Northwest Dane Senior Services where we plant vegetables in a raised garden for the seniors there, and we have a garden program at the library where we teach children about gardening, and the children receive seeds to grow in their own garden at home,” Swanson said. Another LIFE strategy is the Step-Up Walking Club designed for people of all ages, but especially for seniors, to remain self-sufficient. Walkers meet weekly at Crossroads Coffeehouse every Tuesday at 9:30 a.m. where everyone is welcome. They walk for 45 minutes, enjoying social interaction during the day, and getting an historical tour of the village. The Walking School Bus is another strategy developed by the foundation. “This is a great way for children of Cross Plains to have fun and get a little more exercise in their day. For this activity, one parent leads the school bus, taking a route walking along village sidewalks, picking up students along their route on the way to Park Elementary. In the future we hope to extend the route for more kids to walk,” said Swanson. The fifth strategy the LIFE Foundation has instituted is the EMPOWER Program, a program developed to encourage people of the village to get out and get more exercise, which has been very successful. “We’ve done this for three years, from 2016 to 2018. It’s a bi-weekly commitment which is for four months during the winter. When we meet, we have an educational portion in which we discuss different topics, such as food, activity, mindfulness, and then we break up into groups and have group reflection time. Then we do a quick piece of physical activity. We have had great success,” Swanson explained. The EMPOWER Program meets bi-weekly for 90 minutes with 25-30 people attending each session. Swanson said, “We have a weigh-in at each meeting, and all together, people have lost over 300 pounds. We are seeing people being able to be involved successfully; it’s not a diet, but a lifestyle modification. Next, we want to try to bundle it up and share it with other communities so they can implement it also. “We’re thinking this year of disseminating this program to other communities in the state of Wisconsin. We are planning on doing it through the Wisconsin Partnership Program, and through the Healthy Wisconsin Leadership Institute that I worked with for training some young people in our foundation in how to be leaders in health care,” Busch said. For this upcoming year the foundation members plan to package the EMPOWER program and train other communities to implement this program. “Jane sees us as a resource and a mentor for other communities. Her other big strategy that she plans to work on this year is the history of Cross Plains. She plans to collect history about Cross Plains and make it into an interactive map that will require citizens to walk throughout the community while learning about the past. The goal is to capture the history of Cross Plains and make it into an interactive activity. There will be different locations where people can walk to and learn about the past history, possibly using a map, brochure or with your phone using a QR code. We want to build on the past and not lose touch with our history,” Swanson explained. The LIFE Foundation is also focusing on mental and social health for the community, in light of the flooding which occurred in August 2018. “That is a tragedy that our community went through. It was a shock to everybody that it happened so quickly that night. That’s the direction we are going in in our new strategic plan, we are working on mental and emotional health, and social health,” Swanson said. If area residents have any questions about becoming involved in LIFE Foundation events and activities, if you are interested in joining, or would like to be on their e-mail list to receive newsletters, email Briana Swanson at crossplainslife@gmail.com. The foundation’s board members are President Briana Swanson, Vice President Jane Busch, Bud Busch, Mike Axon, Emmy Benson, Maureen Berghoefer, and Dan Jarzemsky.